For those who have been following my mobile blogs, you knew our great Peru/Belgian team (i.e. the Institute of Tropical Medicine Alexander von Humboldt (IMTAvH) in Lima and the Institute of Tropical Medicine (ITM) in Antwerp) was working on something special: a mobile moodle for iPhone. In 2008, our Peruvian/Belgian team won the Tibotec Reach Initiatives grant, which allowed us to start looking at solutions to get two types of smartphones (iPhone and NokiaN95) linked up with the mobile moodle learning platform. We started out rather basic, you can read about the first steps in this previous post. And now we are at the brink of releasing the code. 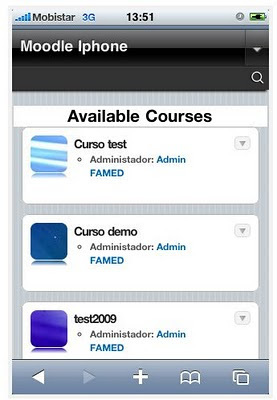 Yes, I am not kidding, look at Mobile moodle's monthly newsletter here to see the excitement rising. Just last week the great Peruvian/Belgian team (Luis Fucay, Beto Castillo Llaque and Carlos Kiyan, with Maria Zolfo and myself cheering on) released the amazing Mobile Moodle for iPhone development, which is currently being bug-tested to ensure we can deliver a (as good as) bug-free open source code for you all to use. How did they do it? They got hold (after politely being given the permission) of the WPtouch for iPhone code by Dale Mugford of Bravenewcode. They started exchanging notes on the mobile moodle forum and only in an amazing 1 (one!) month of developing, they managed to get this amazing code going. So keep in touch, tweet it, say it, media it.... and we will soon be releasing the complete codes for you to transform to your own needs. Oh, this feels so exciting! The Institute of Tropical Medicine Alexander von Humboldt (IMTAvH) in Lima and the Institute of Tropical Medicine (ITM) in Antwerp developed an educational mobile application allowing access to the latest medical information for continuing medical education (CME) of physicians working in HIV/AIDS care in remote locations in Peru. The didactic material consists of 3D animations simulating interactive clinical cases which are adapted to mobile devices. In this pilot phase ten Nokia N95 and ten iPhone equipped with a portable solar charger are used by physicians located in 20 urban and peripheral Peruvian HIV clinics. Now Photoshop is an amazing software, but it is expensive and it is very much focusing on full-time designers that really get into all its complicated features. If you only use pictures from time to time and you only go for basic functions like color adjustments, resizing images and so on, the free an very user friendly Irfanview will be the photo-imaging-editor for you. However if you are looking for just this bit more, Sumo Paint will most likely give you all the features you are looking for... and more. Sumo Paint is a browser application and it has 2.0 features, so it offers many of the contemporary features you expect as a member of the cloud. Lockergnome just released a video on Sumo Paint in collaboration with techoverloads and it gives you a five minute quick overall view of its possibilities... nice! Competitions you could join... and win! For those of you with an interest in developing countries and/or mobile applications, there are two wonderful initiatives that you can enter. First of all (deadline 31 March 2010) building your own widget for Vodafone. If you sift through the categories, you will see that education does not yet have a widget app uploaded... so let us all jump on this possibility. Building widgets is a feasable endeavor if you are a bit comfortable with html and CSS. If you feel insecure, just go through this 'how to build a widget' manual. Even if you do not want to apply for one of the money prices (big money! ), understanding how a widget can be build could help you with future educational techniques (it is like mash-ups, you just combine what you already use and combine it for an extra educational purpose: gps + twitter search => finding educators in your region). If you really want to make a difference, enter the (nearing deadline) competition organized by the Worldbank for poor regions threatened by violence. 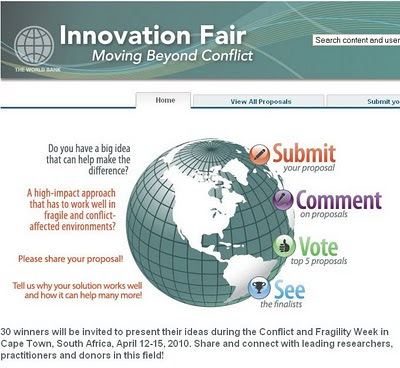 If you have field tested an educational pilot and you could see this benefiting a violent or poor region, upload it as a project to their competition: Innovation Fare: Moving beyond Conflict' that will take place in Cape Town, South Africa. Make sure you read the application guidelines thoroughly (a few of the submitted projects do not comply with the requirements and that is a pity). Come on let's get great technology supported education on the map! Artists almost always impress. They work out of the box, they show us what is real and how unreal reality can be. So facebook now sues a brilliant Dutch artist Walter Langelaar from the Worm artist collective. Why? Because they have developed a brilliant web2.0 suicide machine that actually erases ALL and EVERYTHING you have put on a particular social network site. So why is facebook (which started out as a fun endeavor for students) suddenly so angry (= lawyers, threatening letters, hostile words)? Because if you write yourself out of facebook, your data still remains in their servers, so they can use it for commercial purposes (your preferences, your interests...). So if facebook sells this data to third companies, those companies learn a little bit more about yourself. Now, if you use the virtual suicide machine to erase your facebook login, EVERYTHING gets erased, so your data can no longer be used for any commercial or other uses. To me that sounds like freedom of speech, freedom of choice, freedom of your own life. Facebook tried shutting down the site by blocking the IP of this application, but know the collective will soon be releasing an open source version of their application (still under construction). No matter how interesting facebook might be for any educational purposes, sending lawyers to friendly artists (Dutch)is just not done. For let's face it, there are enough other networking sites around that do not hassle great, inventive artists. I am considering taking my facebook life into my own hands once the open source equivalent is released by the artists collective. Big Question: The twitter generation: skimming to get content? No thx, I am a struting! In the Big Question launched by Tony Karrer this month, he wonders how we look at instruction in an information snacking culture of skimming content. With twitter, mobile msn, and sms rushing through our lives, and knowledge growing exponentially, one could wonder if we pick up content in a more and more abridged form and whether this is affecting our learning. I think it is, so I am turning down once and awhile and I am … strutting through education. Staying alive! The way in which I point towards interesting content has been changing, I used to comment more, but nowadays I just retweet or ‘like’ and ‘digg’ stuff more often. This omits me from adding personal remarks to the content I am redirecting. The fact that I do not add possible question marks to the redirected content means that I do not go through all the processes Bloom so eloquently described. With redirecting I skip the highest digital learning level, namely: creating. So I wonder if I am selling myself short with this byte-size content assimilation. I found myself rushing through much more than just those short messages, I was skimming articles, skimming posts, skimming social media, skimming newspapers, skimming… everything but my milk. And although it gave me the idea that I was doing things much more efficiently as I was speeding up in this speeding age, I also found myself becoming more stressed. So is speed reading and content snacking the way to go? Sometimes I feel it is very save to take this option: personal life, social contact, procrastination… but for my professional life I have come to a turning point, I have started to slow read again. Now, I did not yet go to tortuous mode yet, but I am aiming to get there. For did not the tortoise outrun the hare in the end? Snacking content might well be the way our brain processes content anyway, in that case we do not even need to care, but on the other hand a lot of educators expressly tell us that narratives add to a deeper understanding. So how do we link skimming content with a deeper understanding of that same content? Lots of questions, but I still belief narratives and in-depth reading add to long-term understanding, even if we live in an ever rapidly changing world, understanding needs to account for something? And so I feel instruction should also allow people to take time and know they do not need to rush or skim. Taking time is okay. So instead of running, I decided from this year onward to strut content. Struting in a new world Grand Theft auto IV style. Andrew Churches is curriculum manager of computer studies and teaching and Learning technologies at the Kristin school in Albany Auckland, New Zeeland. His educational wiki, called educational origami, was voted as the best wiki in 2008 and in 2009 he was again nominated for best educational wiki. What makes his wiki so interesting is that it focuses on the core of TELearning, the learning itself. He does this in a variety of ways, but what caught my eye (Thanks to the formidable Wilfred Rubens), was how he uses and interprets Blooms taxonomy for this digital age. 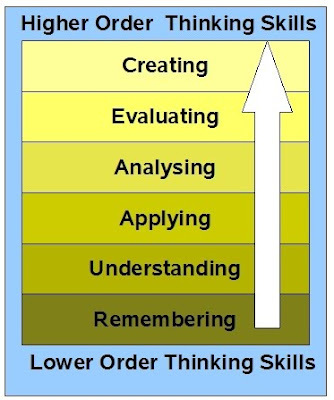 Bloom’s taxonomy was not revised by Andrew, but by Lorin Anderson and David Krathwohl, who published their findings in 2001. The key change in Anderson's and Kathwohl's approach was that they added verbs rather than nouns for each of Bloom’s categories, and that they pushed creating to the top of the thinking skills. So where does Andrew’s wiki come in? Well, the way Andrew makes Bloom’s revised taxonomy relevant is amazing. In just 75 pages Andrew succeeded in giving me a deeper understanding of everything I collaboratively set up with learners and link it to Bloom’s learning framework. In just a couple of hours time (= reading through the pdf) I could pinpoint mobile learning inside Bloom’s framework and I could see where some defaults were located within some of the mobile cases I have co-developed. Admittedly the ideas that popped-up should be investigated, but it gave me an extra insight to work with. For example: as mobile learning is on the rise, more voices add to the idea that mLearning has been focusing too much on the technology and not enough on the learning process (at least if you sift through the papers). If I go through the six levels of the revised taxonomy of Bloom, I can see that throughout some of the mobile projects I did not include any or too few tools to give learners access or building blocks to get access to all levels. In the mLearning projects I have had the pleasure to co-design, I did include ‘remembering’ tools (mgoogle, but no tool to enable – or give attention to – mobile bookmarks like e.g. mobile delicious. On the ‘understanding’ level, I feel a bit more comfortable as we did include personal commenting, mobile Facebook… and other tools that could lead to a better understanding. A mobile mindmapping tool might have been nice though, the only thing is, that a mobile mindmap demands more space to keep an overview, so that might be problematic with mobiles. On the applying level I think we did well: we demanded the learners of the Tibotec mobile project to share and upload stuff, so that feel okay. On the ‘analysing’ aspect however, I feel the least comfortable, as analysis demands tools that just… take up more space than available on a small mobile device (an iPad or netbook might do the trick though). There are some tools for mobile analysis, but still the human brain likes an overview of data (spreadsheets), graphics… so unless a mobile device is provided with a beamer so you can project unto a wall of some kind, analyzing certain information from your mobile keeps on being tricky. The ‘evaluating’ level was okay, as well as the ‘creating’ level (skype, shozu, fring to exchange notes, cases and collaborate). So overall I am happy with what we do on the mobile space, but there is still a lot of room to improve the learning, especially if mobiles are the only tool to get to the learning. If you ever did a Bloom analysis on any of your mobile learning or eLearning projects, let me know, I would love to read up on them. If you are a teacher, principle or kids-psychologist worried about counseling or guiding young children on the topic of bullying, this software might be of interest to you. Bullyproof will be released in March 2010, but you can check it out with the developer Brendan O'Keefe pre-release. This FREE software caught my attention for two reasons: first of all the obvious one in that it could reduce bullying, and second that it uses software that has been around in Africa for some time now, including great live saving medical applications. Because the software is open source and free, you can adjust it to your language also (if necessary). First of all bullyproof says to decrease bullying by using sms's. The free Bullyproof software, developed by Brendan O'Keefe, enables kids from primary and secondary school to send sms-allerts when bullying is taking place, or has happened. Because more and more young children have access to a mobile phone, and because it is a daily used instrument to those who have it, the technology is low threshold. Sending an sms is also not conspicuous, as I also found my kid sister sms-ing her friends without even having to glance at her mobile phone screen (straight from writing her sms inside the pocket of her jacket). Bullyproof SMS is a social innovation designed to help reduce bullying. It enables students to report anonymously via their mobile phone, and schools to be notified and respond instantly to bullying or cyber bullying incidences. The Bullyproof SMS software is available free to all schools and organisations that have an existing policy on bullying. (from their website) How it Works: Students text a report to a dedicated number and the report is then instantly forwarded to the appropriate person(s) mobile phone so they can respond in a timely manner. The report is also automatically forwarded via email to the school counsellor or principal. The Bullyproof SMS software comes preloaded with a database of tips and strategies for students that can be accessed by sending the keyword 'bully tip 1,2,3,4 'etc to a dedicated number. As we all know their is an increased need to tackle cyberbullying, just this week the BBC wrote another article on it, and some parents indicate cyberbullying is the source for their kids suicide. Some countries like Australia put it high on the educational agenda as more than 1 million dollars is taken out to do research on the topic. Taking all this into account the bullyproof software might be a good and affordable (free) application to check out. If you want to get more information on it, twitter Brendan, he replies swiftly and if you like personal contact, he even offers skype sessions to exchange all the features of the bullyproof software. View more presentations from Brendan O’Keefe. What is the link with Africa? Bullyproof is an application based on frontline-sms-software which has been actively used in Africa for a variety of social reasons (elections, social action...). So if you hadn't heard of Frontline which is software from Kiwanja.net, take a look, as it might inspire you to develop some mobile applications for social change as well. For those of you interested in mobile medical applications, check out the medic frontline-sms examples, really fantastic!! A couple of weeks ago I wrote a post (see here) on how to convert a DVD you have bought to a format that can be played on a mobile device. Some of you have tried it already, but there was a question concerning subtitles. If you want to, you can use AVS4YOU to add the appropriate subtitles to your converted format. 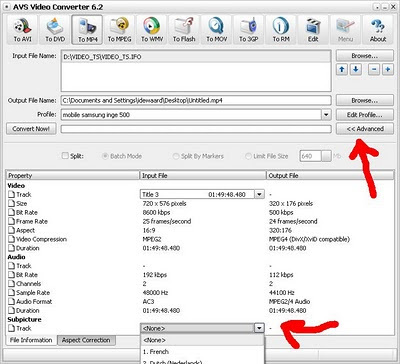 You follow the steps as indicated in the prior post, up until the moment you make yourself ready to click the convert button. Before you push the convert button, we are going to add the subtitles. In order to do this, you push the ‘advanced button’. This is it, now you can simply click on the ‘convert’ button in AVS4you and you are ready to watch a movie your partner did not want to see, while commuting to and from work… at least that is what I do with my newly bought Japanese movies (Rock-on Kitano!). Over the years I have been enjoying Janet Clarey's blogposts very much. They are insightful as well as practical. Her writing (and comments) also show her passion for the eLearning related job, and life in general. 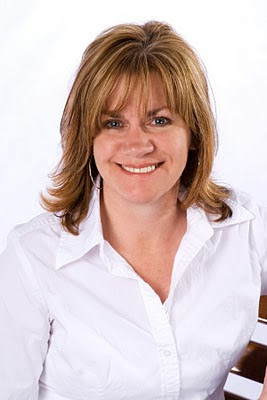 Janet is "an industry analyst and researcher. She covers social media, microlearning, e-learning, instructional design, and learning technologies for the workplace." (got this from the about section on her blog). She is a frequent publisher for Brandon Hall (an independent research center specialized in new media for corporations) and she delivers a lot of presentations, I have not seen her perform live, but I sure think she can liven up a room with her knowledge looking at her online dynamics. Brandon Hall research is not completely free for all it's research, but Janet is always willing to share her knowledge and add to any eLearning discussion with relevance and meaning. Her main interest is in corporate learning, but once you start reading her, you will see that she crosses all borders of the eLearning realm. Her blog features an abundance of eLearning tips and tricks and why I wanted to put her in the picture right now is because of a recent post that got me into design thinking mode. In this post she refers to the D.School (at Stanford) Bootcamp Bootleg free download , which is "a curated collection of material developed by teaching teams throughout the design world over the last five years." This pdf can be downloaded here. "The guide outlines each mode of a human-centered design process, and describes a number of methods which may support your design thinking throughout the process. 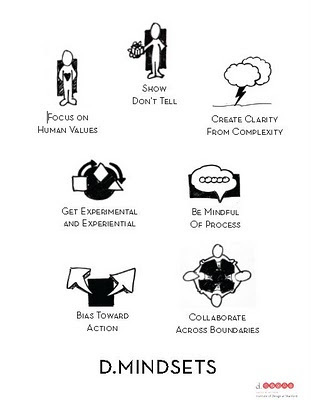 These process modes and methods provide a tangible toolkit which support the seven d.mindsets ̶ shown on the following page ̶ which we feel are vital attitudes for a design thinker to hold." Personally I like the bodystorming technique that is described as one of the methods. Basically this 36 page document provides you with some great tools that can prevent you from ever getting stuck in an eLearning or writers block ever again. Now, if you want to stay on top of a variety of eLearning and social media topics like the one above, get Janet's blog onto your blog-roll or feedreader (if you have not done so already, that is). All of us eLearning researchers and teachers are invited to the next presentation of free CIDER sessions. The next session features a presentation and discussion with Dr. William Egnatoff, Queens University, Kingston. Students at a French immersion high school in Ottawa and a school in Brazil exchange recipes, using a combination of French, English and Portuguese. The Brazilians discover they like poutine! Children in a rural Sierra Leonean village devastated during the civil war and a school in Mississauga collaborate to produce an online art gallery of pictures about what peace means to them. What do these examples and hundreds of thousands like them mean to the participants? What are the benefits and challenges of collaborating across countries and cultures in the design, implementation, and assessment of learning activities? Such activities by their collaborative nature support global education, whether it emphasizes peace, social justice, citizenship, ecology, or any topic or issue of shared interest. Bill Egnatoff will present a conceptual framework for bi-national collaboration of this sort. He will illustrate the framework from relevant literature, through his experience in teaching a course called Global Education Through International Collaboration, and through his peace education design research with colleagues in Canada and Sierra Leone. That work includes experimentation with, and evaluation of, a variety of tools and systems to support collaboration among twinned school communities, pre-service and in-service teachers, teacher educators, and researchers. When: Wednesday, February 10, 2010, 11am-12pm MT (Edmonton).